If you had asked me a year ago where I’d be I wouldn’t have seen this coming: a major move and career shift. Well, when Brian and I said yes to Jesus years ago, to do whatever He said, no matter what. And we meant it. It also started in Brian’s heart years ago when he learned about planting churches during his master’s study back at Wheaton. And then as we drove cross-country, wondering where they needed Covenant Churches. Then about a year ago, I started feeling this sense that we were about to move and I was being called to something else. A year ago, I was working as a part-time adult ministries staff at our church. We had gone through 3 staff departures (and would have one more to come). I was able to fill in here and there, having more opportunities to lead, make decisions, meet weekly with our lead pastor and be a part of our church. I had a sense that all of these things would not just be preparing me for Lakeview ministry, but something else. Eventually I had a sense that we would be moving from Duluth, but didn’t share that with many. This will be one of many blogs (where have you been blog? I’ve missed you!) to come. But here is the quick story about just what in the world the Askers are up to now. In April last year, Brian and I went to our conference annual gathering. I received my ministry license and Brian renewed his. We were meeting the Church Planting coach, Mike Brown, since he was going to come preach at Lakeview in a month. I wanted to touch base about his visit. Brian had other ideas. Well, I don’t know if the sky fell when I said it, but looking back, I do know that when I said it, something shifted in the world and as we have been swept up in this adventure called church planting. 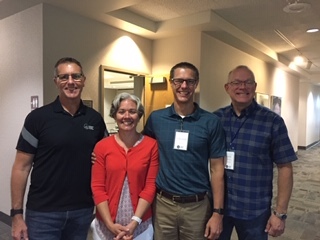 Alex Rahill (national director of church planting for the E Cov), me, Brian and Mike after we found out we passed our assessment. Whew. It was a long 3 days of feeling scrutinized. Brad, bless him, was about to go on Sabbatical, but he spent time on the phone with us, drove hours up North (he was in shorts, we were in fleece), ate bad bar food and told us his dreams for 2 hours. We took the kids to Mankato for a weekend in early June. They hated the idea of moving (of course! we love Duluth! 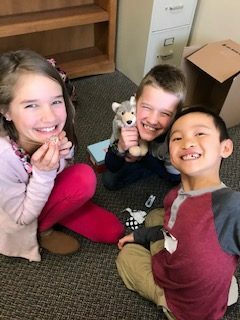 we love our friends! ), but by the end of the weekend, we started to think maybe we were supposed to do this. The kids have received going away gifts the last 3 weeks. It is very, very sweet. They are so, so, so sad to leave. Even maybe angry that God is doing this to us. But we are soaking up our friends as much as possible this super cold, stay at home week! What great timing for them! The green space, the paved trail system, the Y (Thank You Jesus there is a good Y there! No Y might have been a deal breaker! ), the campus (MSU-M is the second largest university in the state), the people and finally, Crossview Covenant. Crossview is 129 years old (our denomination is only 6 years older!). They have an extensive ministry in the city, but have a church in North Mankato. They have a dream to reach the rest of the city with new church plants. God uses new church plants more than any other way in the USA to reach those who don’t know Jesus. We get to start a movement, we pray, to reach not only Mankato, but the nearby rural areas, country folks and other cities surrounding Mankato. It looks like my hometown of Dawson, MN. I grew up around the rivers, silos and corn fields. The snowy drifts, the blizzards, the hotter summers and the rolling hills look familiar! So as we went through assessment (that’s another story for another day), Church Planting Class and our interview, we had to keep the news to ourselves. Our mentors and some friends knew of course, but mostly we kept it to ourselves. That was the hardest part! I love to tell people good news and it just about killed me to keep this secret. We were able to figure out a timeline, tell our church family and Crossview had time to do the same. We moved Feb 14. There are so many good good stories about how God is providing for our needs (like having our friends buy our house, medical bills and 2.5 year insurance headaches coming to a close 12/31/18 so we could sell our home) but for now, here is the first installment of our story. 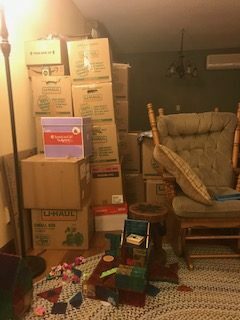 And this is just one tottering pile of boxes that were in the house and you should have seen the garage! We were so sad to leave Duluth! The kids are still going through varying degrees of grief. But we are trusting that there is something else waiting for us which has been prepared for us.